Megachurch pastor and member of President Trump’s evangelical advisory council Robert Jeffress appeared on Fox News this Monday to give his thoughts on the protest movement sweeping professional sports teams. Megachurch pastor and member of President Trump’s evangelical advisory council Robert Jeffress appeared on Fox News this Monday to give his thoughts on the protest movement sweeping through professional sports teams. 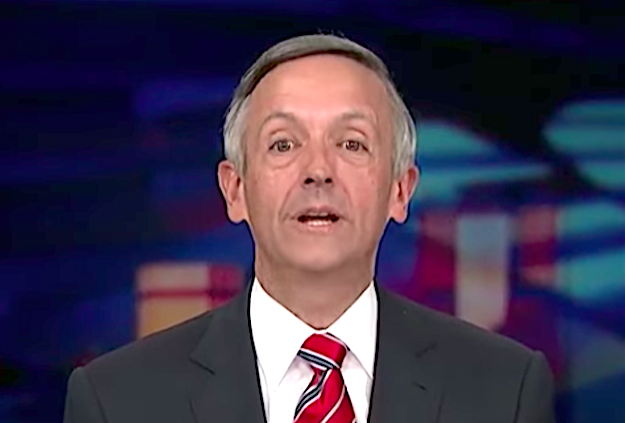 “These players ought to be thanking God that they live in a country where they’re not only free to earn millions of dollars every year, but they’re also free from the worry of being shot in the head for taking a knee like they would be if they were in North Korea,” Jeffress said. Jeffress seemed to argue that players should celebrate the fact that they enjoy free speech rights by remaining quiet. It is an absolute fact that in many countries of the world professional athletes would be imprisoned ― or worse ― for publicly opposing their nation’s anthem or disrespecting their national leaders. If any member of the press doubts this fact, then I would encourage them to take a trip to North Korea themselves, publicly shame Kim Jong Un and then see what happens. All of us should thank God every day that we live in a country where we do not have to fear government persecution for expressing our beliefs.